To simplify access to Gemba Academy's various Training Within Industry (TWI) resources we just created a new TWI page. TWI has the potential to revolutionize how you train your organization! 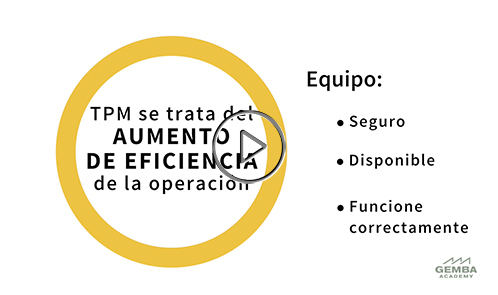 Our TPM (Total Productive Maintenance) course, presented entirely in Spanish, is now available as part of our Escuela Lean! In this course we explain what TPM is, while also covering important topics such as the 6 Big Losses and how to measure them using the extremely powerful Overall Equipment Effectiveness (OEE) metric. Our upcoming courses include Quick Changeover and Hoshin Planning, so we invite you to stay in touch with us. Kurt explains how he and his organization use continuous improvement. Danny and Daniel break down how they apply lean to banking, specifically the mortgage process. Dan shares stories from his time in Formula 1, and from practicing lean in the UAE. Our newest Gemba Academy team member David stresses the importance of having a Strategy Execution Plan. Jon explains the role and value of hypotheses. Kevin explains how to uncover problems that might otherwise remain hidden. Ron explains how the key to real, significant change lies in scientific thinking. It's a process.To learn more, take a look at our Hoshin Planning Course and our Toyota Kata: Practice Makes Progress Course. The Lean Accounting Summit has long served the accounting community by exploring accounting’s role in measuring and motivating the lean enterprise. The goal of this Summit has been to better align Accounting with Operations inside of an organization. We’ve taken this one step further by intentionally bringing in a mix of Management-related topics that are outside of accounting directly, but closely connected to accounting.